So … negative thoughts are what, like an evil spy organisation, running around causing wanton destruction, overwhelming your capacity to function? If that’s the case, then new cognitive skills must be like Tom Cruise, running, jumping, shooting and kicking their way through the negative thoughts, saving the world and getting the girl. It’s a popular concept. As I discussed in my previous post, the power of positive thinking is culturally sanctioned Western folk psychology. We implicitly accept the idea that we have to harness positive thoughts and stop negative thoughts if we’re to overcome life’s obstacles. However, the only rogue notions here are Dr Leaf’s. 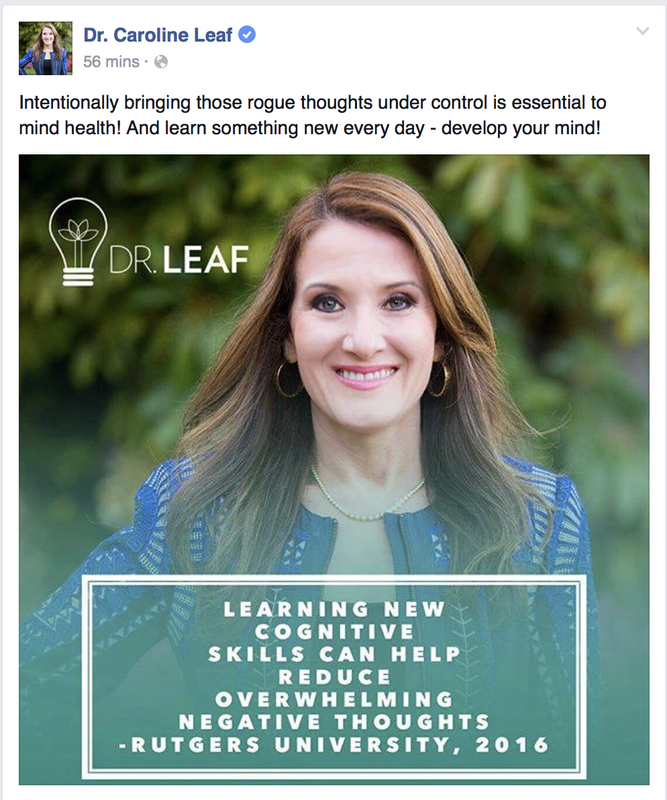 Dr Leaf’s post sounds authoritative and sciency, but is nothing else. It’s vague, and with a bit of deeper palpation, it’s actually wrong. Dr Leaf has gone back to her bad habit of obfuscating her references, maybe because she’s getting lost in her own hubris, or more likely, it’s much easier for her audience to see that she’s just cut-and-pasted the opening by-line of a press release again if she actually disclosed her source. 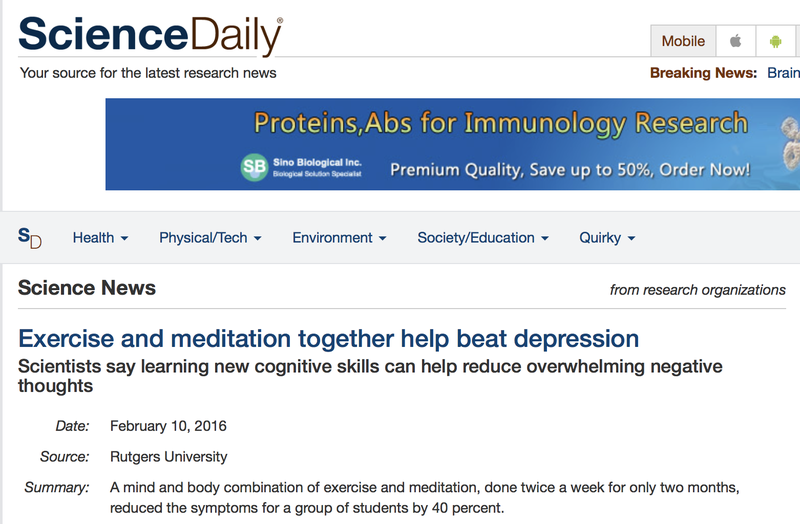 In fact, the article is about a study from Rutgers which studied two behavioural interventions (not cognitive ones), a form of mindfulness meditation and aerobic exercise. The original publication is in the journal Translational Psychiatry , if you want to check it out for yourself. This article isn’t about learning cognitive skills at all. Exercise and mindfulness meditation are tried and true behavioural methods of improving mood disorders like depression, which the authors combined to assess the benefit or otherwise. Neither intervention involved challenging or fighting thoughts, or suppressing ‘negative’ thoughts, or “intentionally bringing those rogue thoughts under control”. Indeed, the mindfulness meditation used involves “the practice of attending to the present moment and allowing thoughts and emotions to pass without judgment.”  Mindfulness doesn’t try to control anything. Rather than supporting Dr Leaf’s declaration that intentionally bringing thoughts under control is essential to mind health, this study contradicts it. Cutting and pasting doesn’t make you an expert. It’s easy to take a sciency-sounding tag line and put it in a pretty little graphic. Everyone does it. 90% of Instagram and Facebook posts these days are faux-authoritative pseudo-science memes that aren’t worth the bytes they’re made of. Junk science is like junk food. If that’s all you consume, then you eventually become an intellectual blob of lard, stuffed full of mistruths and logical fallacies, and incapable of understanding scientific truth for yourself. Dr Leaf’s audience deserves better than junk science and it’s about time that Dr Leaf stopped pretending to be an expert, and started acting like one. Alderman BL, Olson RL, Brush CJ, Shors TJ. MAP training: combining meditation and aerobic exercise reduces depression and rumination while enhancing synchronized brain activity. Transl Psychiatry 2016;6:e726. This entry was posted in Biological, Caroline Leaf, Psychological and tagged criticism, depression, dr caroline leaf, exercise, false teacher, Mindfulness meditation, notion, positive thinking, rogue, Rutgers, tom cruise, Translational Psychiatry by cedwardpitt. Bookmark the permalink. I’d say you sure seem to be so against Dr. Caroline Leaf. I’ve no clue who you are or what title you have, but you should stop putting so much energy into criticizing what she says. Not everyone agrees with what people say. For those I don’t agree with, I don’t bother “following” them on social media then write “posts” about them. You should consider how it makes you look. I don’t agree with what you say here and there, but am I gonna go write posts about it? No. Why? because I’d rather not waste my time on you but spend it by doing something else. If you don’t agree with her, then don’t mind her. How about posting something worthwhile reading? hmm? I appreciate your candid views, though I couldn’t help but notice how your comment is just dripping with irony. If you think criticising me for being critical is a valid criticism, then be my guest. I understand some people will find my ongoing critique of Dr Leaf distasteful, and they will judge me accordingly, but there are many others that are very appreciative and supportive. But honestly, public perception as a guide or motivation is fundamentally flawed. The tide of public opinion changes, well, like the tide. I write to provide a counter argument to Dr Leaf’s unscientific and unscriptural teaching, and to hold her to some level of accountability. I think you’d see that if you reviewed the entire body of my work rather than making a snap judgement based on one post. For the record, I have posted a number of articles completely unrelated to Dr Leaf. Since your approach to my work is closed-minded and judgmental, I doubt you would find them ‘worth reading’, but you’re more than welcome to peruse them if you wish.